Elizabeth, widow of Richard Startute, Citizen and Fishmonger of London; d. 5 Dec 1620 aged 74 years. 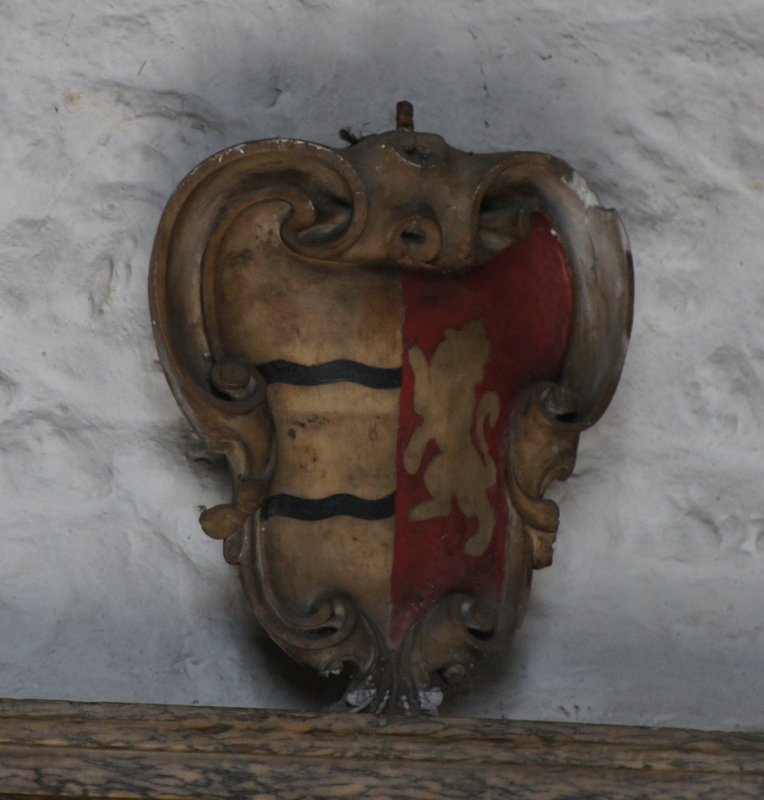 Arms: On a lozenge; Argent [blackened] between two bendlets gules three covered cups sable. Lysons gives the field as argent, but Pepys and Godman as azure; both call the charges garbs. 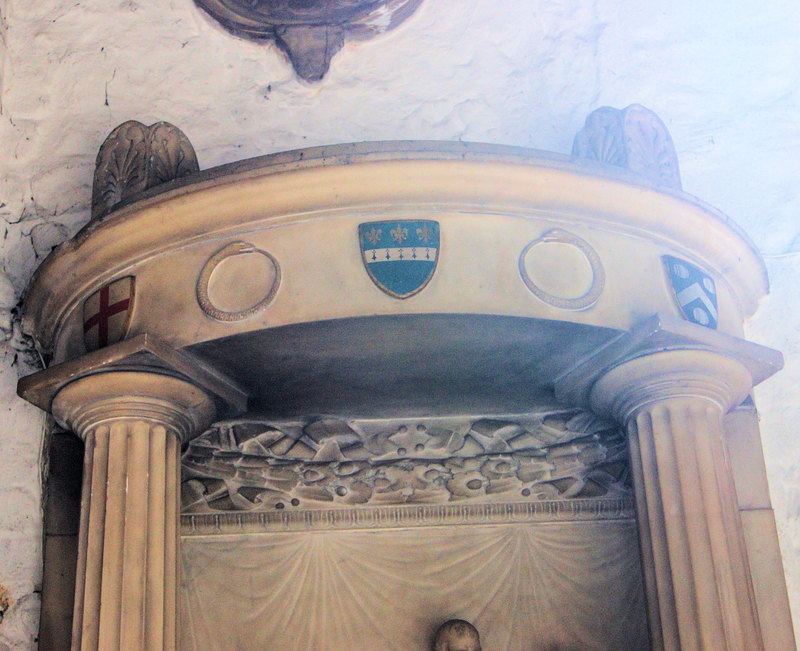 Hugh James son of Hugh, Rector of Upwell, and Philippa née Hobart of Norfolk, d. 14 Jan 1728/29 aged 17. 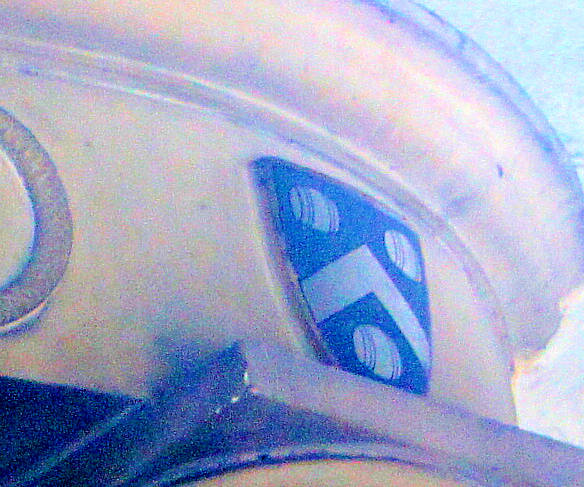 Crest: On an esquire's helm, may be a salamander. Robert Clarke Esq son of Roger Clarke Alderman of London, married to Margaretta daughter of John Langton sometime Governor of the English Company in Sprucia [i.e. Prussia], Poland, and their daughter Frances, died aged 1 3/4 years; he died 30 May 1610 aged 36. 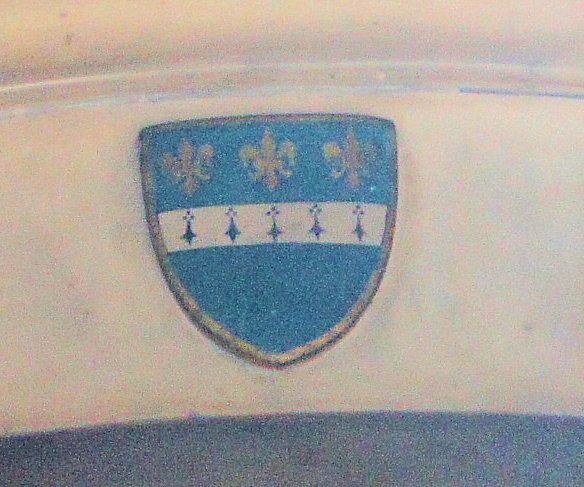 Plausibly the "sable" is tarnished argent. 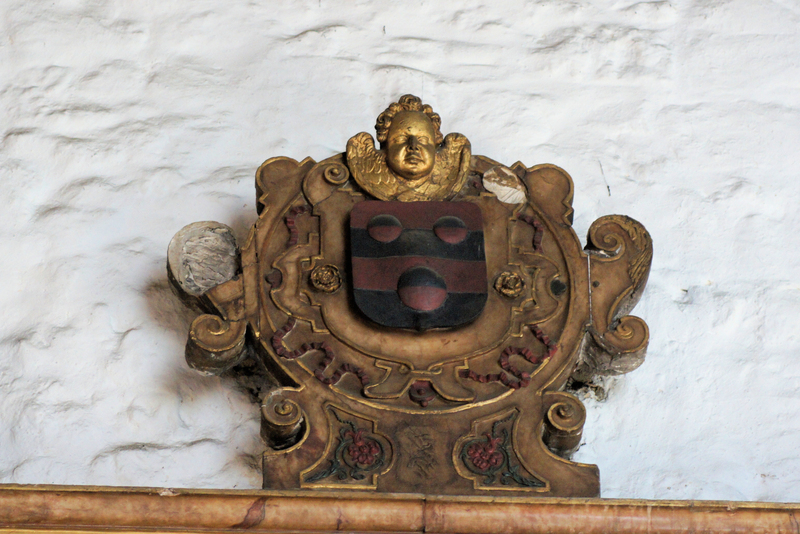 Arms on corbel: Clarke impaling: Sable two pallets engrailed between in chief three fleurs de lys or. 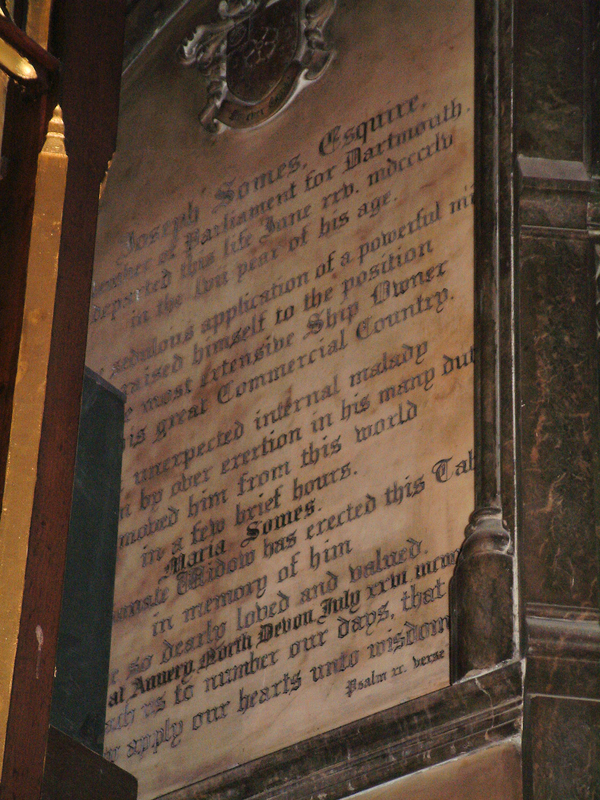 The description above is based on Lysons, especially the tinctures, which may then have been partially visible; however some details have been corrected. 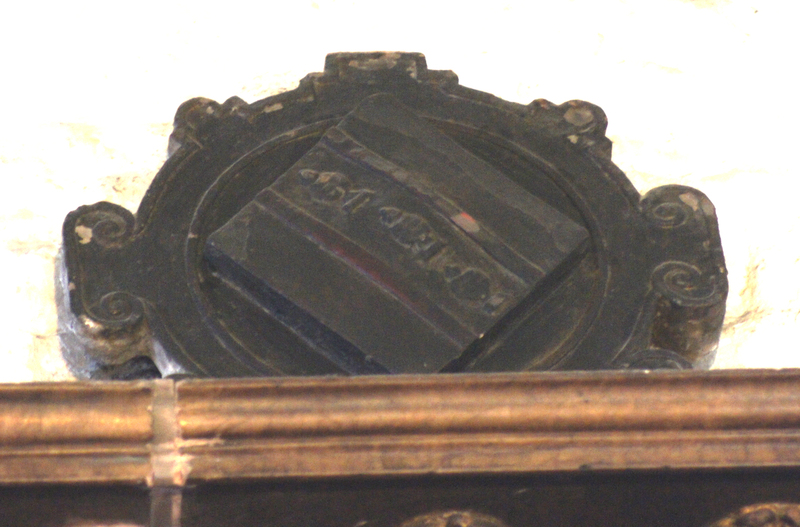 Three disks, two at the head and one on the base of the monument, may have depicted emblems. 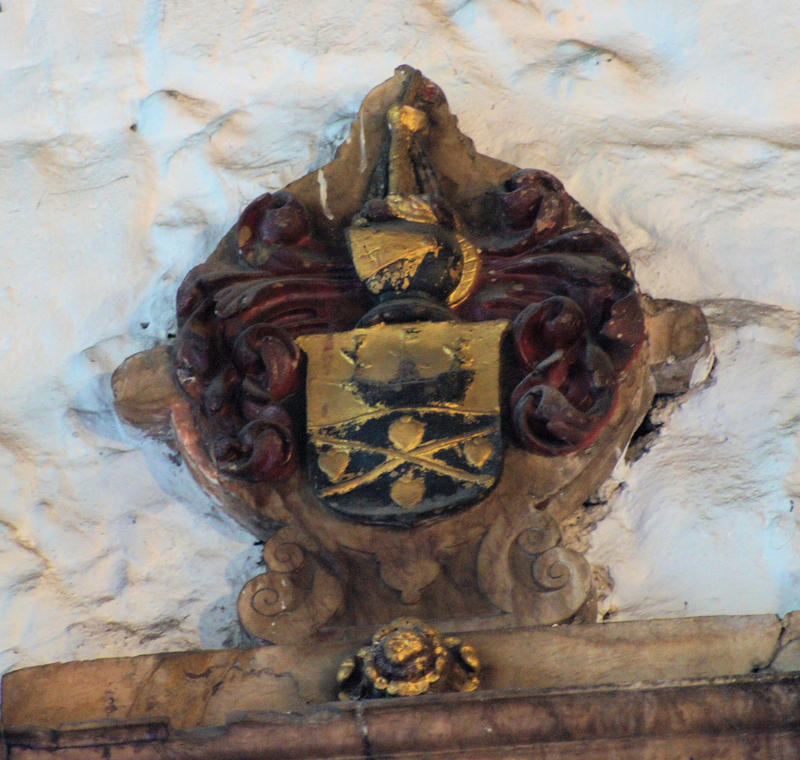 Additional details from Pepys and Godman, who do not describe the crests. 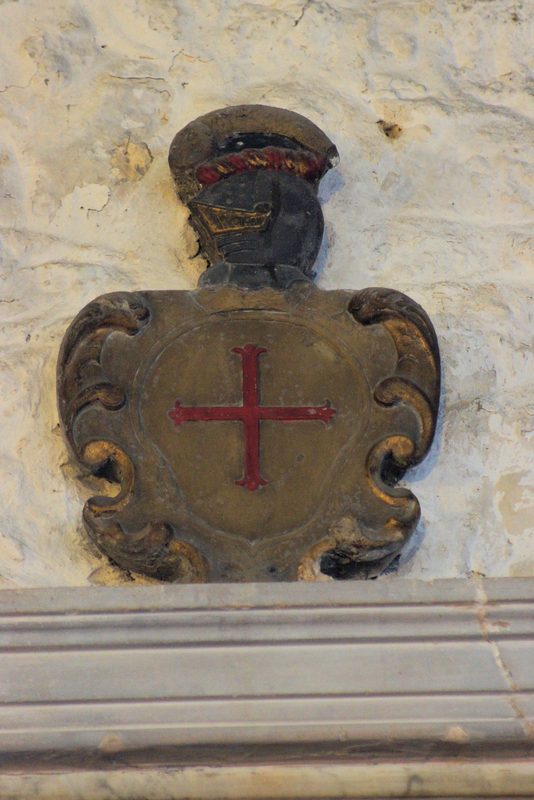 Lysons does not describe the heraldry at all. Tinctures are from plausible matches in Burke GA.
Pepys and Godman report the tuns as "undecipherable, owing possibly to a careless repainting" and give the chevron as ermine, the tuns or. 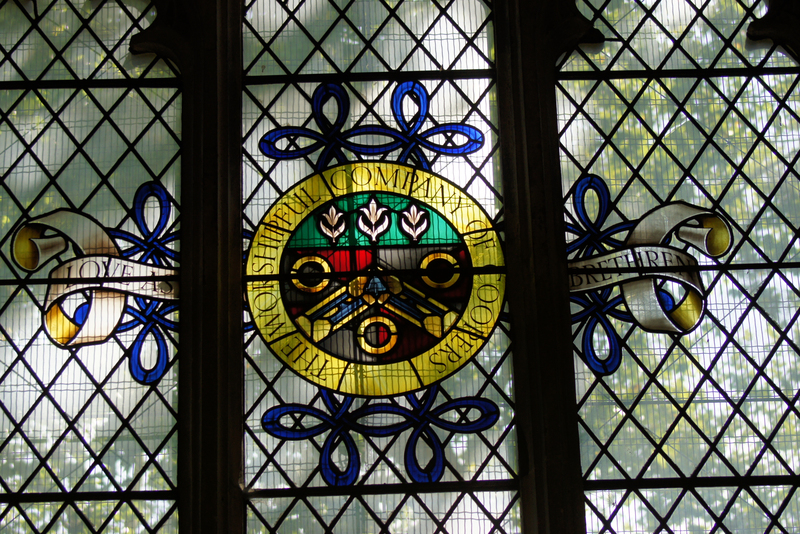 According to Pepys and Godman the field is gules; according to Lysons it is azure. 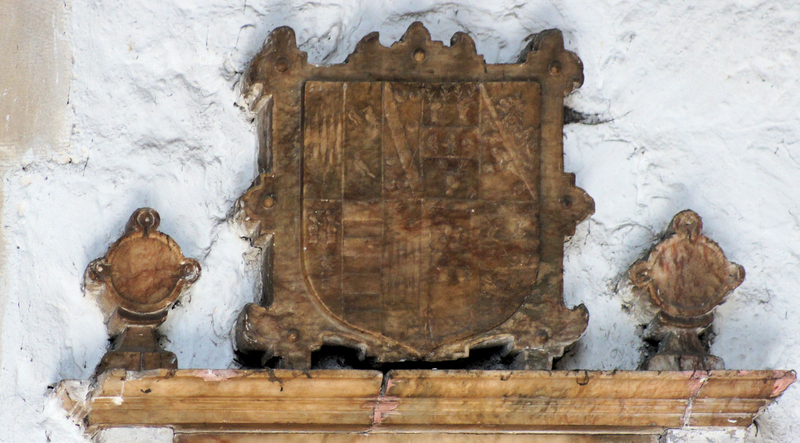 Burke GA has: Azure two tilting-spears in saltire between four hearts or on a chief or a ship proper; Crest: A broken mainmast or shrouds sable in the roundtop six spears in saltire [sic] on the top the flag of St George; for Spert of Tetbury GLS. Lysons gives no tinctures; Pepys and Godman describe it as it now appears. 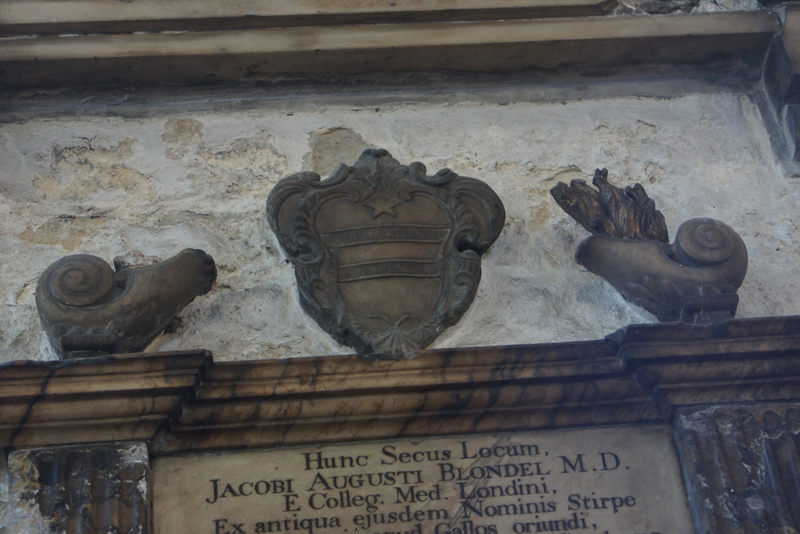 For James Augustus Blondel MD who died 4 Oct 1734 aged 68. 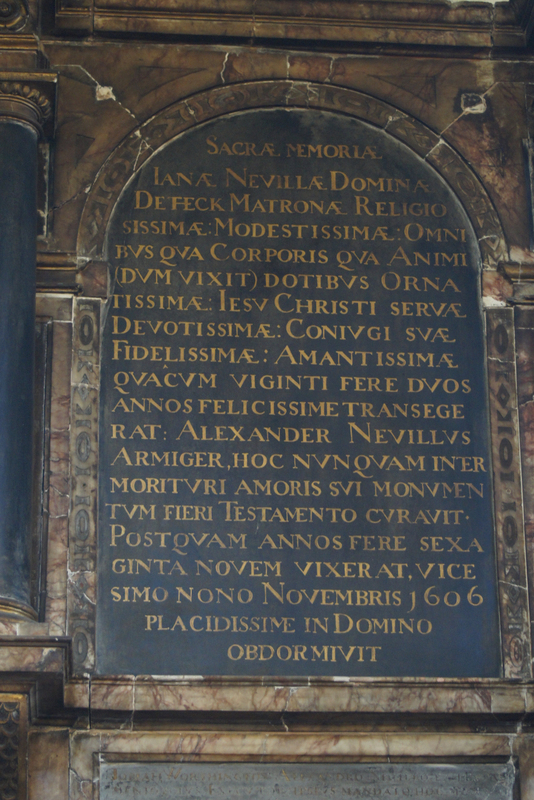 For Nicholas Gibson Sheriff of London [died 1540] and his wife Avis. He founded the Coopers' Company School in Ratcliffe 1538; erected 1900. 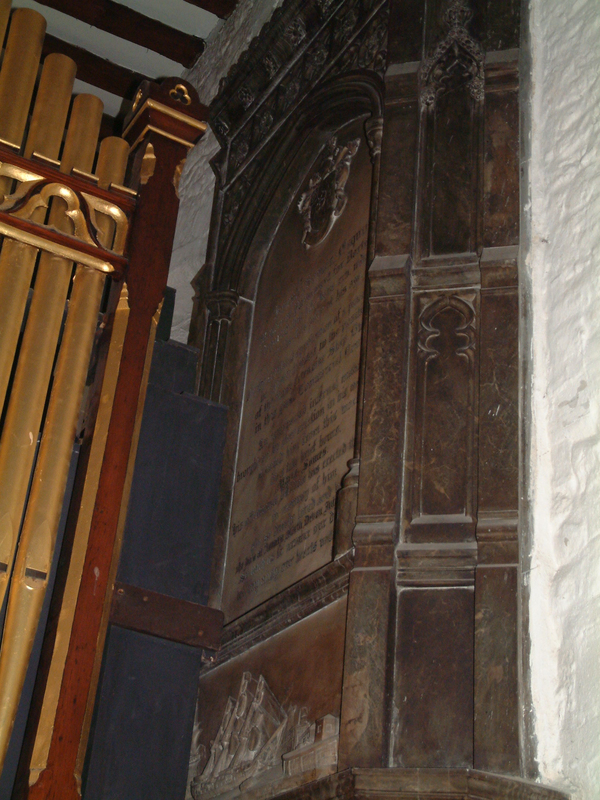 Strype's editions of Stow, 1720 and 1755, report an original brass for Nicholas Gibson. By Lysons' time it seems to have gone. 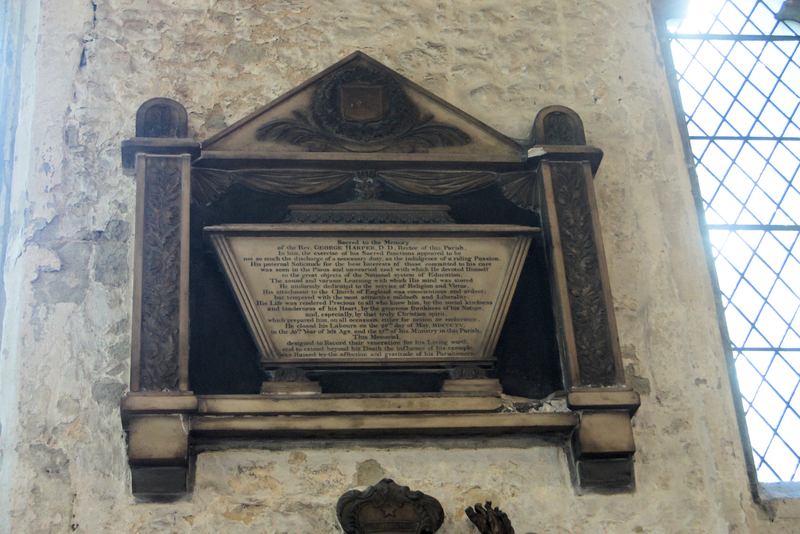 Stow seems to have misread his date of death as 23 Sep 1510. 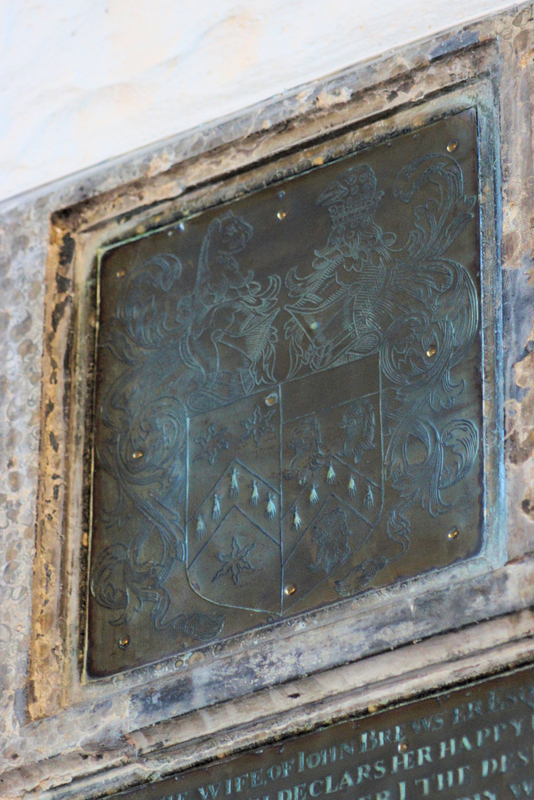 Confirmed by Lysons, but Pepys and Godman repeat the blazon while sketching it crudely to make the crowns appear like a label or. This seems to have been copied by a restorer. 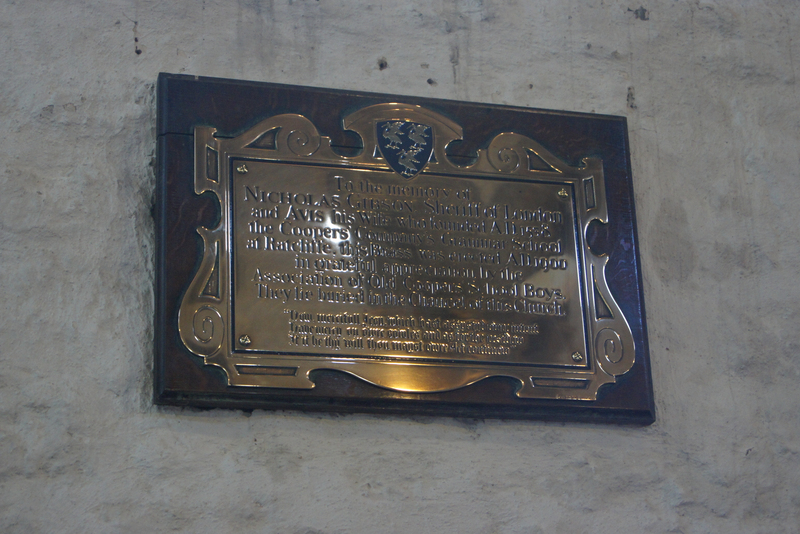 For Lady Jane Dethick "alias Garter" wife of Alexander Neville of Poplar, died 29 Nov 1606 aged 69. 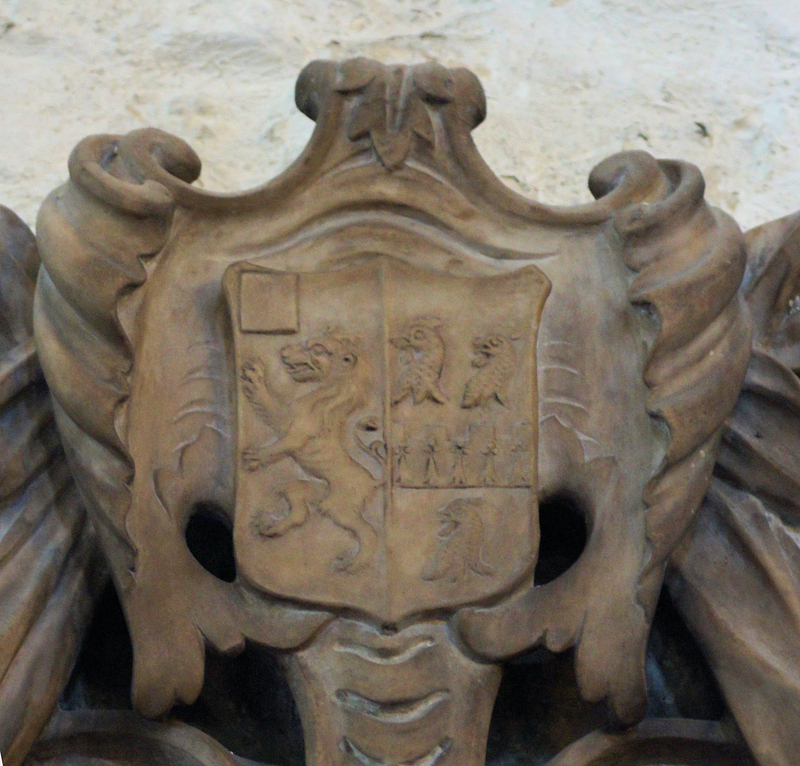 Many details now differ from the blazon reported by Lysons. 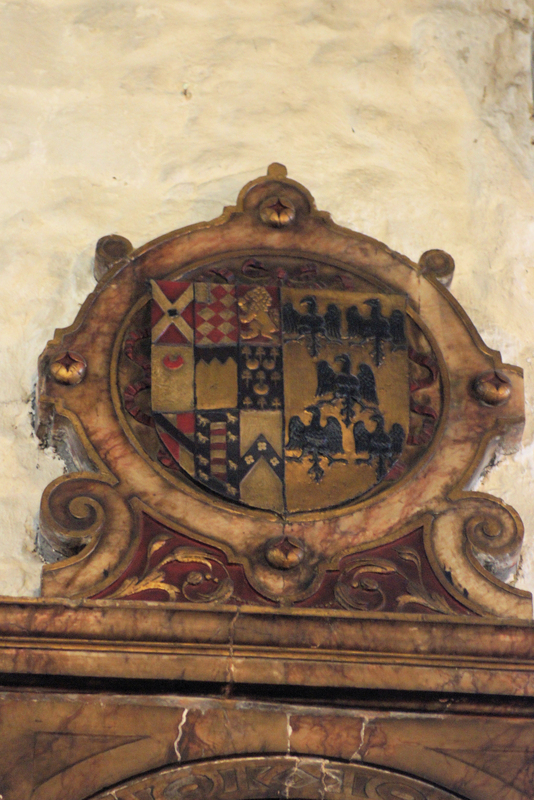 The inscription states that she was married to Neville for 22 years, being the widow of Sir Gilbert Dethick, Garter King of Arms, who died in 1584. 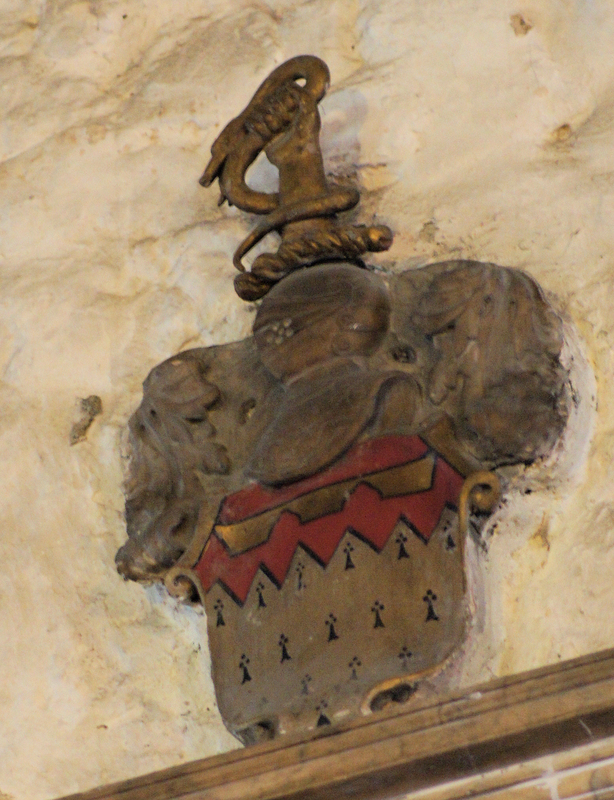 Lysons says she was born a Duncomb of Buckinghamshire, and the impalement is not the arms of this family; however Burke GA and Papworth give: Sable five eagles displayed in cross argent, for Duncum. 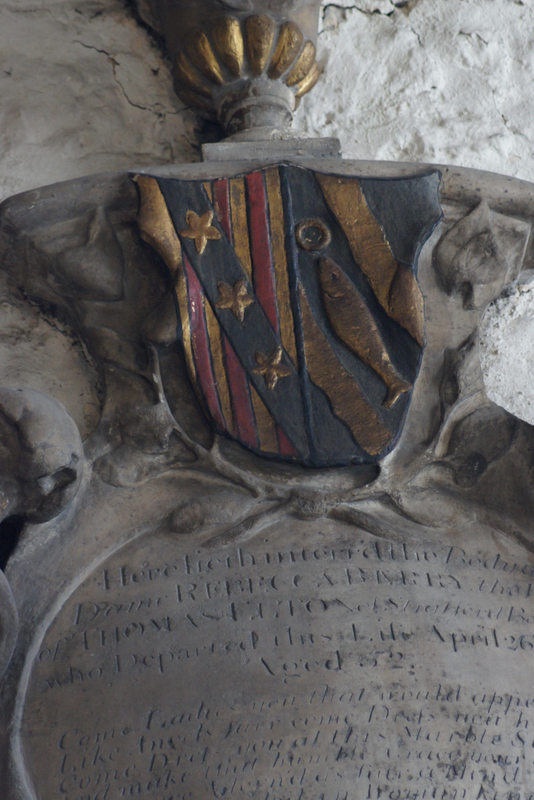 For Alexander Weller JP of Steward Street, Old Artillery Ground, Citizen and silk thrower, died 10 Nov 1734 aged 68. 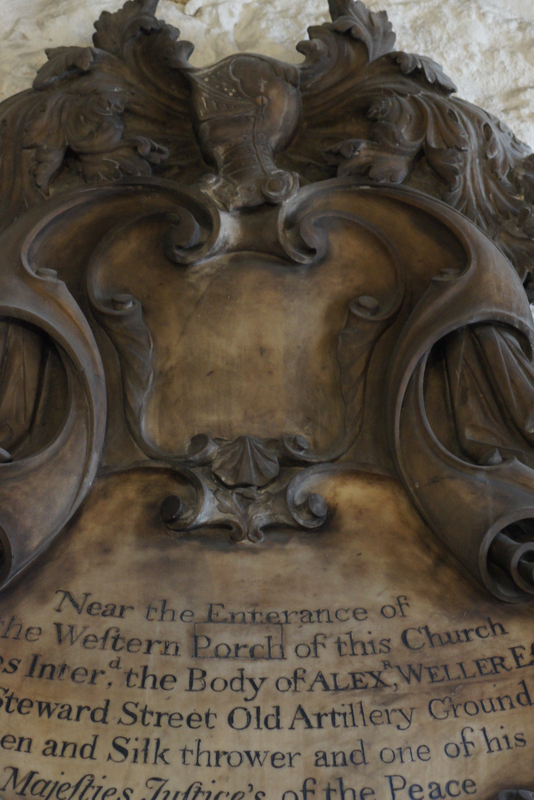 The shield above is now almost blank; Pepys and Godman reported two chevrons visible on the dexter, of which there is still a faint trace. 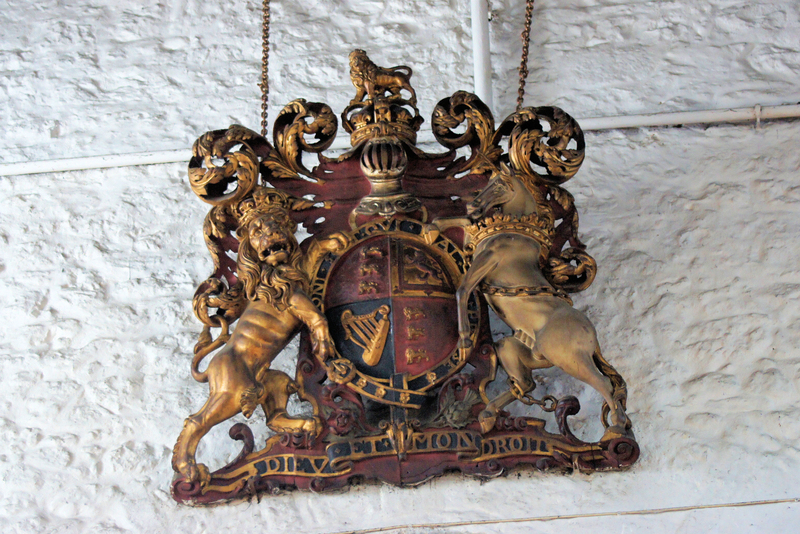 Lysons blazons it as follows: Sable two chevronels between three roses argent (Weller of Rolvenden KEN); impaling: Argent a lion rampant gules on a chief sable three escallops argent (Russell). 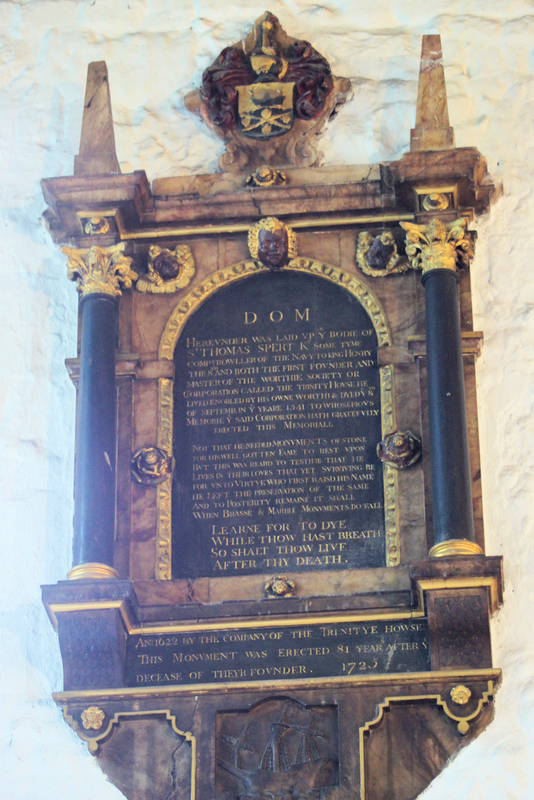 For Joseph Somes, shipowner of Mile End Old Town, MP for Dartmouth, who died 25 Jun 1845; the monument was erected by his widow Maria [née Saxton], died 26 Jul 1911, who is also commemorated. 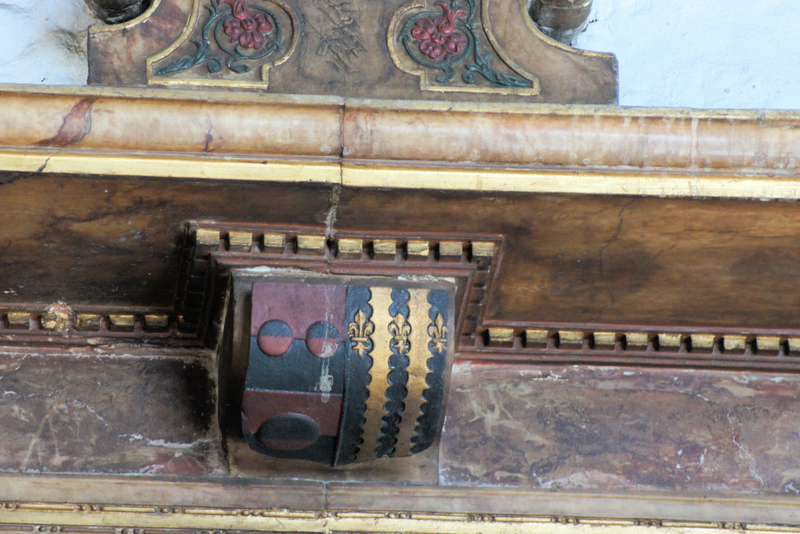 Tinctures are taken from his hatchment at Igtham Mote KEN.